Ypres was strategically located along the roads leading to the Channel ports in Belgian Flanders. This Belgian city had been the scene of numerous battles since the sixteenth century. With the German failure at the Battle of the Marne in September 1914, and the subsequent Allied counter attacks, the ‘Race to the Sea’ began. Each army outflanked the other moving north and west. This so called race ended at the North Sea coast. This area of Flanders contained the last gap through which either side could launch a decisive thrust. After the fall of Antwerp, the British Expeditionary Force (BEF) under the command of Field Marshall Sir John French (pictured right) retreated to Ypres. They arrived there between 8 and 19 October and began to bolster the Belgian and French defence. The Allied defensive position around Ypres took the shape of a salient because it could best be defended from the low ridge of higher ground to the east. However, it was vulnerable to superior German artillery. 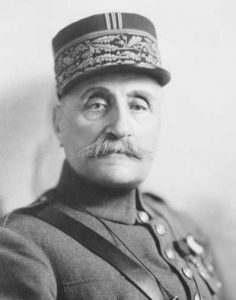 A thirty-five mile long line in the centre of the bulge was held by the BEF while the French Army in the area, commanded by General Ferdinand Foch (pictured below left), manned the flanks to the south of the city. The two Allied Commanders, Sir John French and General Foch both retained the hope of launching an offensive believing a coordinated attack would enable the Allies to recapture the industrial city of Lille followed swiftly by Brussels. But, the German Army Chief of Staff, Falkenhayn soon quelled their optimistic beliefs. The First Battle of Ypres began on 18 October when Falkenhayn ordered an advance to break through the Allied line and capture the ports of Dunkirk, Calais and Boulogne by first striking the Belgian defences on the Yser River between Dixmude and Nieuport. Despite fighting valiantly the weakened Belgian Army began to fall back and the Belgium King, Albert, opened the sluices that held back the sea on 27 October flooding the land along the twenty-mile strip of land between Dixmude and Nieuport and thus creating a two-mile wide water barrier that forced Falkenhayn to halt and reconsider his plans. The newly assembled German Fourth Army under the command of the Duke of Wurttemberg and the cavalry corps of the Bavarian Sixth Army commanded by Prince Rupprecht now began to assault the city of Ypres (pictured right). These forces gave the Germans a considerable numerical advantage over the BEF’s seven infantry divisions (one being held in reserve) and three cavalry divisions. Sir John French could only count on a few divisions of Indian troops already en route as reinforcements. These Indian units would prove to be outstanding fighters in both offence and defence. 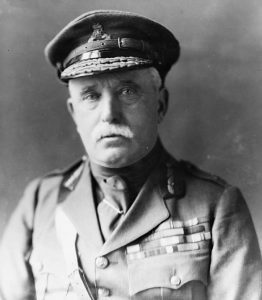 German forces engaged General Douglas Haig’s First Corps at the northern end of the salient at Bixschote and Langmark. A ferocious British counterattack repelled the Germans and thanks to superior British rifle fire, they were able to hold this sector. The British rifles were so fast and deadly that once again the Germans mistakenly believed they were facing British machine guns. Further attacks took place around the salient pushing the British off and down the eastern ridges. On a narrow front on 30 and 31 October the Germans drove a smaller dismounted cavalry unit from its position at Zandvoorde on southern end of the salient and then threatened the town of Gheluvelt. The small hamlet and chateau of Gheluvelt was defended by a force of around 2,000 men from assorted battalions. Repelling the first German attack after a large artillery bombardment eventually the Germans superior man power began to tell. Breaking the line at the ‘angle’ held by two company’s of the King’s Royal Rifle Corps and the Queens they Germans advanced into the town and the chateau only to be repelled by a bayonet charge conducted by the Worcesters and thus re-establishing the line. Fighting continued around the salient. On 11 November, two premier German divisions containing the elite Prussian Guard attempted to break the British lines just north of the Menin Road in the Non Bochen (Nuns’ Woods) only four miles from Ypres itself. Supremely confident, the Germans marched into the waiting guns of the British. Members of the Black Watch, firing into their flanks caused them to break and run into the woods where they were flushed out by another bayonet charge by the Ox and Bucks Light Infantry aided by a motley collection of soldiers (cooks, officer’s servants, medical orderlies, clerks, and engineers). As they exited the woods again the rifle fire of the Black Watch took a further toll. This effectively ended the First Battle of Ypres. Fighting around Ypres would linger on until 22 November when the onset of winter weather forced a break in hostilities. The combat during this engagement was extremely confusing and unrelenting. 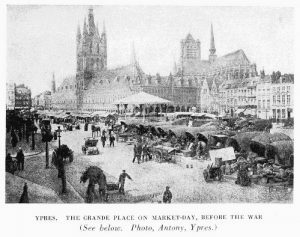 After the fight, British survivors were content to say that they had been at “First Ypres”; no more information was necessary to explain what they endured. 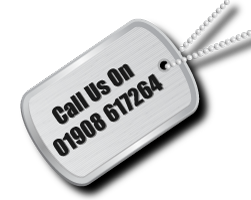 One soldier, Private Donald Fraser, explained it this way: ‘one [a man] was not a soldier unless he had served on the Ypres front’. Less than half of the 160,000 men the BEF sent to France came out of the encounter unscathed. After November 1914, the British would remain as Ypres’ guardians for the rest of the war. 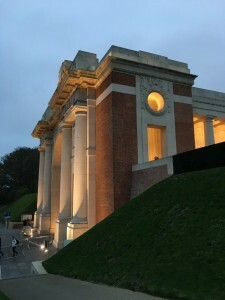 Rifleman Tours offers four battlefield tours to Ypres, all (apart from the two day Taste of Flanders Battlefield Tour) stay in the heart of Ypres, a few hundred yards from the Grote Markt and the Menin Gate.